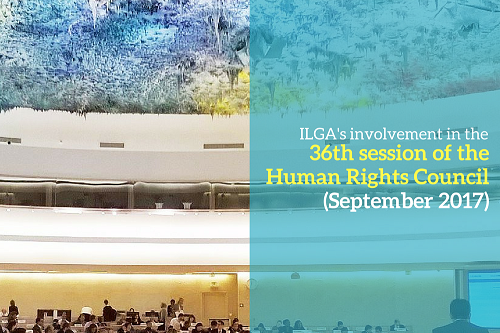 During the 36th session of the Human Rights Council, ILGA worked with human rights defenders from various countries to help deliver statements during the UPR adoptions. During the 27th UPR Working Group Sessions, Tunisia received 22 SOGIESC recommendations. It accepted 2 and noted 20 recommendations. Click here to read the joint statement by COC Nederland and ILGA on behalf of the Tunisian Coalition for LGBTI+ Rights. During the 27th UPR Working Group Sessions, Indonesia received 12 SOGIESC recommendations. It accepted 2 and noted 10 recommendations. During the 27th UPR Working Group Sessions, Philippines received 2 SOGIESC recommendations. It accepted 1 and noted 1 recommendation. During the 27th UPR Working Group Sessions, South Africa received 7 SOGIESC recommendations. It accepted all 7 recommendations. During the 27th UPR Working Group Sessions, Finland received 10 SOGIESC recommendations. It accepted 2, partially accepted 1 and noted 7 recommendations. Click here to read the statement by ILGA-Europe, prepared in consultation with Trasek, an association for the rights of gender minorities, and Finnish Youth Co-operation - Allianssi, the National Youth Council of Finland. During the 27th UPR Working Group Sessions, Poland received 11 SOGIESC recommendations. It accepted 6, partially accepted 4 and did not accept 1 recommendation. Click here to read the statement by ILGA-Europe, prepared in consultation with the polish LGBT organization Campaign Against Homophobia.